I think that on our best days, we who profess to be Christian, we are storytellers. This morning I have three stories for you. Two of which we know the ending; the third is a work in progress. The first story is from Shakespeare’s tragedy King Lear. It is a complex story, as complex as life, but there is one thread I find particularly memorable. King Lear wants to retire and so devises a practical plan to divide his kingdom among his daughters – an ancient 401k plan. His plan is to apportion their inheritance based on their expressed love for him. The oldest daughters, as practical as their father, say whatever they have to in order to gain the largest share. The youngest, Cordelia, simply says that she loves her father and nothing more. Lear doesn’t consider how the actions of Cordelia’s life have written large her love. Lacking the profusion of spoken love, Lear disinherits her think his retirement years will be better spent with the enthusiastic love of the other two daughters. It is the calculus of a small world person whose borders are shrinking to concern for only himself. Of course life does not work out as Lear planned. Eventually his two daughters, now holding power and resources, reduce their father to a mad old man wandering around the bogs of England. That is when he encounters Cordelia. Lear is a realist, he expects to receive from her what he knows he deserves, what he has coming by all the laws of the land and human experience. When, contrary to expectation or reason, she does not scold or shame him, but forgives him. She opens up for him the wide world of grace, mercy, and forgiveness. What Cordelia does for Lear, Jesus does for the whole world. But Lear does not pass through the gate into a new world. He descends into the darkness of his own small, disintegrating world. It is a Shakespearean tragedy. 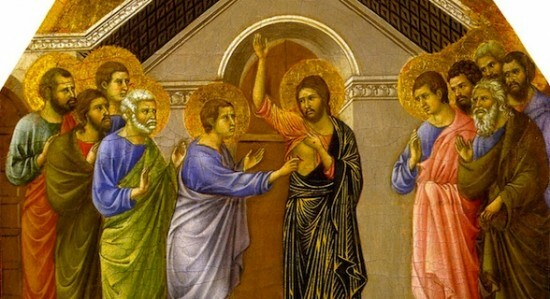 My second story comes from today’s gospel and our encounter with “Doubting Thomas.” The scene opens with Jesus appearing among the disciples although Thomas is not with them. Interestingly no one among them says “Welcome back,” or “We knew it,” or even “What took you so long?” No one anticipates Jesus return. No one. Did they doubt or disbelieve? Scripture does not say. Upon his return Thomas does not believe, openly declaring he will not believe unless he places his finger in the wounds of Jesus. And so we label him “Doubting Thomas.” But I wonder why wasn’t Thomas there the first time? Is his disbelief consistent with what we know about Thomas? This is the same Thomas who otherwise is depicted in the Gospel according to John as authentic, straight-forward, sincere, and even courageous. In the 11th chapter of John, Thomas is the one who urged the disciples to go with Jesus to raise Lazarus even thought it might mean their deaths (Jn. 11:16). And in chapter 14, when Thomas doesn’t understand Jesus’ metaphorical speech about the place he is going to, Thomas does not do the holy nod – you know, “Jesus said it, I don’t get it, I am not even curious, so I will just nod.” Thomas asks the practical: “Master, we do not know where you are going; how can we know the way?” There is something terribly pragmatic about Thomas and he is no retiring wall flower. You know what he is thinking. And in this case you know what he disbelieves. Why? When the other disciples were cowering in fear in the Upper Room, Thomas was not there among them. We don’t know where he was, but I’m guessing that the ever practical Thomas was getting on with his life, figuring out what was coming next and getting on with it. Thomas is, first and foremost, a realist. I can imagine him thinking to himself, “I thought Jesus was the Messiah…guess not. Let’s be real about this. Jesus was nailed to the cross. He is dead. My hopes and dreams are as dead as he is. But I will not hide in that room. I know one thing, life moves on, so I might as well get on with it.” His world is shrinking to the practical matter of taking care of himself. One week later, everything changes. And it is not Thomas’ pragmatic realism. What changes is the world, his reality, or at least his perception of this life. “Peace be with you.” Then he said to Thomas, “Put your finger here and see my hands, and bring your hand and put it into my side, and do not be unbelieving, but believe.” Jesus uses Thomas’ own mocking words, not to humiliate or scold him, but simply to confront him with the possibility that his reality was too small, his vision of what is possible too limited. When Jesus calls him to faith, to trust, Thomas is being invited into a much wider, larger world of newness, new life, and new possibilities. And Thomas passes through the open gate of mercy, reconciliation and forgiveness – and his world extends to the shores of the Indian subcontinent and to eternal life. Thomas now knows what is possible, what God can do, and will come to know what God can do through him. It is no Shakespearean tragedy but a Gospel story of redemption and healing. The third story in still in progress. It is the story of our lives. It is not a story about our doubts, but a cautionary tale about the world we perceive. Are we small-world Christians who are governed by limitations and am tempted to justify that with a layer of “pragmatic realism” –we’ll always have the homeless. Is the vision of our world defined by failure instead of possibility, governed by scarcity instead of abundance, ruled by remembered offenses rather than by forgiveness, reconciliation, and mercy? Are there relationships we are about to give up on, disappointments we can’t seem to get over, the wrongs we have done – or have been done to us. These are the markers of a small and shrinking world. Easter and the Resurrection is Christ holding open for us the gateway to a bigger world. where relationships can be restored, disappointments dissolved into new Hope, the old wrongs forgiven, and all things can be raised to new life. May the grace of God bring you into a wider, larger world filled with the Mercy of God. Amen. This entry was posted in Sunday Morning and tagged believing, Cordelia, do not be unbelieving but believe, doubting thomas, King Lear by Friar Musings. Bookmark the permalink.